According to legend, when Bach was 20 he walked more than two hundred miles to meet Buxtehude, the most influential composer of his time. 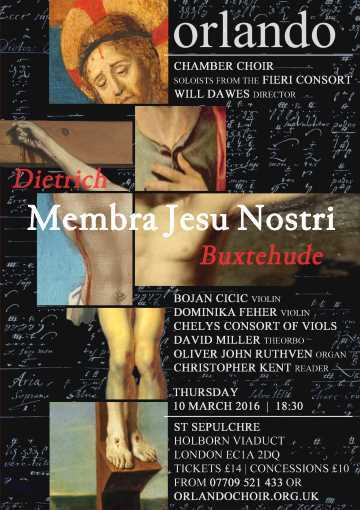 Dating from 1680, Dietrich Buxtehude's Membra Jesu Nostri is a cycle of seven cantatas which contemplate different parts of the crucified Christ's body, starting with his pierced feet and ending with his face. Each corporal allusion in the text is the starting point for a meditation on a different aspect of Christian revelation. The music ranges from harmonic suspensions suggestive of great suffering to passages of a Song-of-Songs-like sensuality and sections of timeless simplicity. Buxtehude's masterpiece was a favourite of our friend, fellow bass and former chairman David Harris who sadly passed away in March 2015. Orlando Chamber Choir dedicates this concert to his memory.